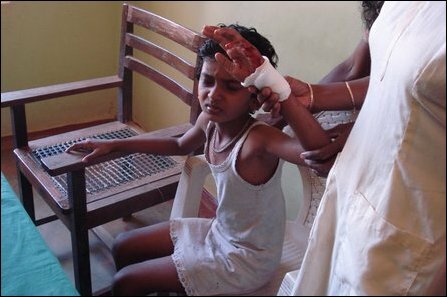 Sri Lanka Air Force (SLAF) bombers Saturday noon bombed a locality, at 9th division in Puthukkudiyiruppu of Mullaiththeevu district, where refugees are settled with ICRC provided shelters, causing injuries to at least three civilians, initial reports from the medical authorities at Puthukkudiyiuruppu hospital said. Two teenage students and a 4-year-old child were the wounded victims rushed to the hospital. The victims were identified as 4-year-old Sevarajah Selvaranjan, 10-year-old Amirththasan Vithusalini and 18-year-old Saththiyaseelan Saththiyarajah.